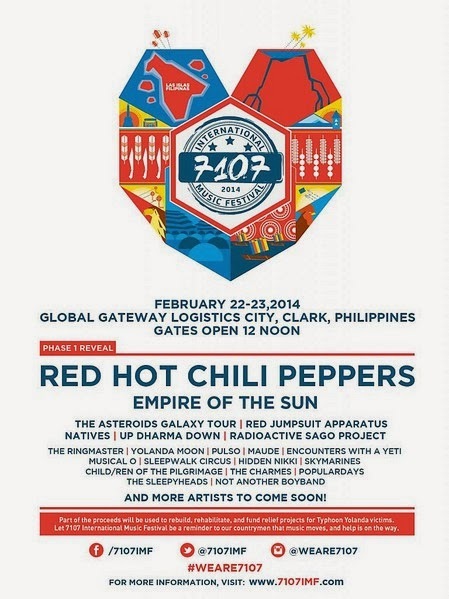 7107 International Music Festival, the premier two-day concert destination hosting the world’s most beloved and influential musical acts, have confirmed their lineup to include legendary headliners Red Hot Chili Peppers and Empire of the Sun, as well as Red Jumpsuit Apparatus, The Galaxy Asteroid Tour, Natives and many more. 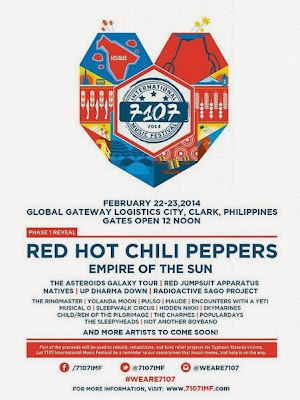 The highly anticipated outdoor event will present an unparalleled global gathering through music with a takeover at the historic Clark Base outside of Manila Feb. 22 -23, and is slated to attract more than 20,000 concertgoers across Asia. This coming December 21, 2013 at Coral Way Open Parking, SM Mall of Asia, Rakista Radio brings you the very first “Rakrakan Festival” – the biggest, the loudest, and inarguably the most ambitious OPM rock festival ever to be written in the annals of Philippine history. And I’m not saying this just because I’m the writer of this article; I am saying this because I can actually feel it in my bones! For starters, we’re talking here about fifty of the most awesome bands in the country, both from the mainstream and indie scenes, blasting massive speakers simultaneously on two stages from the hot, sweltering humidity of the afternoon until the cool, breezy atmosphere of dawn. Radiorepublic.ph and the Philippine Red Cross are letting music be the total pick-me-upper and do the healing on December 11, 2013 for Music Heals, a gig dedicated to the survivors of Super Typhoon Yolanda (Haiyan). 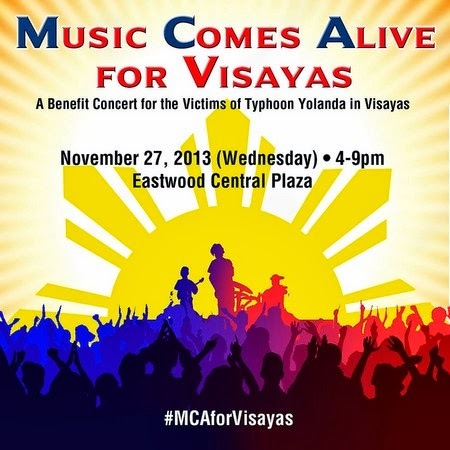 We are staging an intimate experience for fans to get up close and personal with their favorite artists for an event wherein all proceeds go directly to the Philippine Red Cross in support of the families of those who have and continue to suffer as a result of the largest typhoon in recorded history. 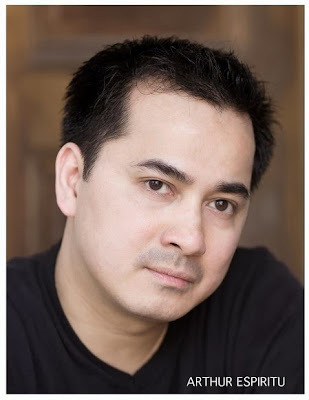 The UPAA is sponsoring comedian Willie Nepomuceno in “COMIC RELIEF: It’s more fund in the Philippines” on December 14, 2013, Saturday, 8:00 PM, at the Music Museum in Greenhills, San Juan City. 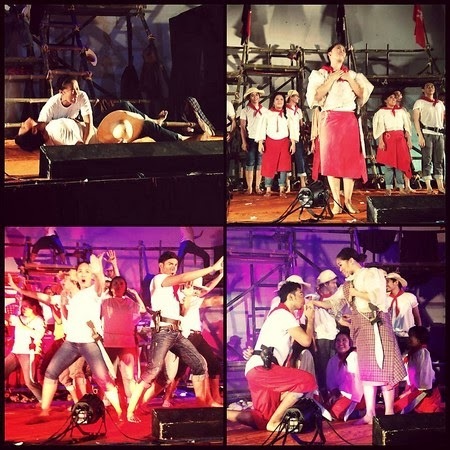 The show is for the benefit of UP students, faculty and staff deprived of facilities and resources by Super Typhoon Yolanda, specifically those in the devastated UPV Tacloban College and UPM School of Health Sciences in Palo, Leyte. 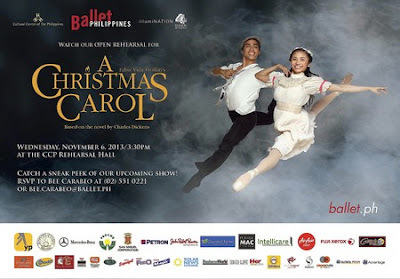 Prima ballerina Lisa Macuja-Elizalde is dancing her last performances of The Nutcracker to cap the third and final year of her Swan Song Series. The series is her farewell to her favorite full-length classics. 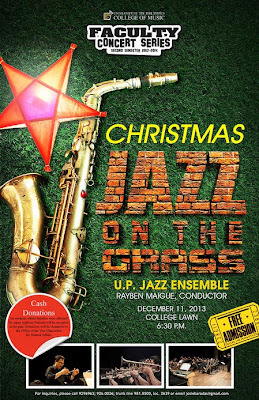 The University of the Philippines College of Music is presenting the UP Jazz Ensemble in a concert on Wednesday, December 11, 6:30 pm at the UP College of Music lawn. Dubbed "Christmas Jazz on the Grass," the event is part of the College's mandate to showcase its teaching of fine music as well as its offering to the academic UP community in the forthcoming festive season. Cash donations can be received at the venue gates and these will go to UP students from Samar and Leyte whose families had been affected by supertyphoon Haiyan (local name: Yolanda). Goodness Rising, a fundraising concert. 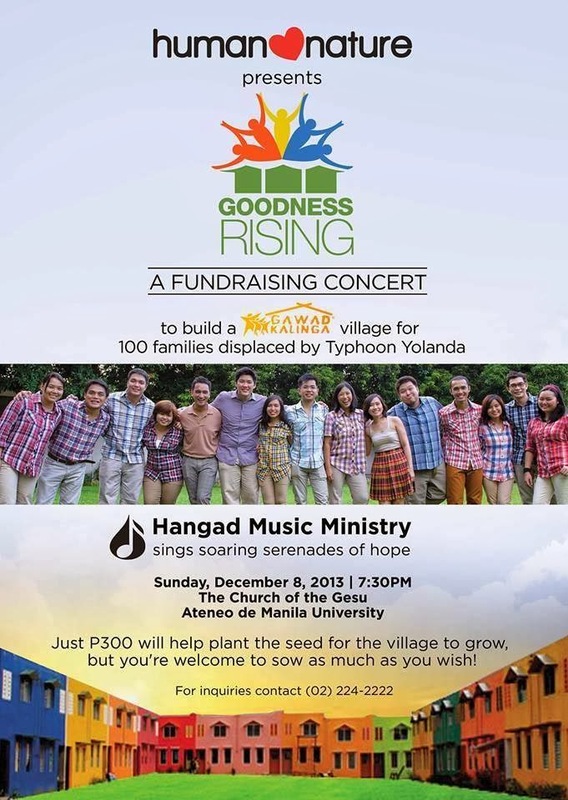 Help build a Gawad Kalinga village for 100 families. 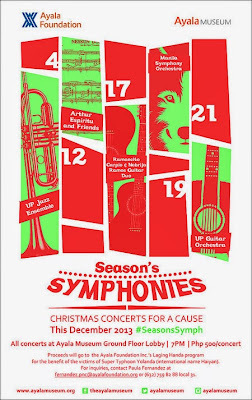 Dec. 8,7:30 pm, Church of the Gesu, Ateneo de Manila University. On December 14, 2013, Saturday, get ready for the second installment of the Philippines’ first and biggest outdoor music festival---SMART Music & SPINNR present EXCEPTION MUSIC FESTIVAL. 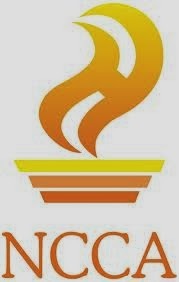 The event is a project of BIG FISH International - the country’s leading dance event-organizing company. 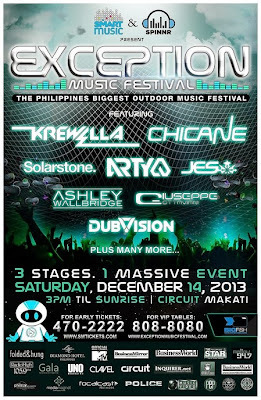 Set to take place at the Circuit Event Grounds in Makati City, the festival will feature some of the most major global artists in Electronic Dance Music (EDM) today. The University of the Philippines College of Music Extension Program proudly celebrates the festive season with a thought-provoking musical adaptation of Fr. James Reuter's "The Coming of the King" on Saturday, December 14, at 2pm in the Abelardo Hall Auditorium. In this free event, the College wishes to receive voluntary cash donations that will go to UP students from Samar and Leyte whose families were affected by supertyphoon Haiyan (local name: Yolanda). The Speech Cup, which is open to high schools and colleges within Metro and Mega Manila, includes competitions in Oral Interpretation (for solo performers) and Speech Choir. 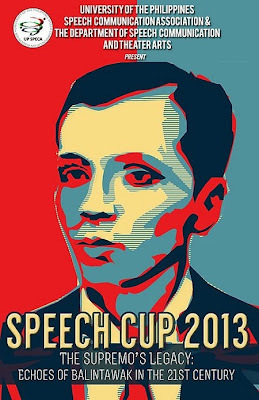 Through the Speech Cup, UP SPECA aims to provide the youth with an opportunity to express themselves through performance art. 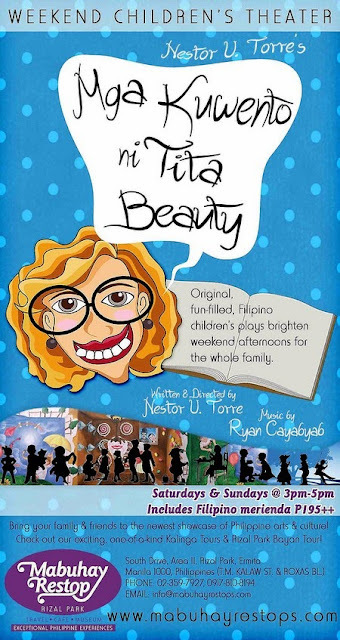 Discover Filipino values with the entire family as you enjoy an afternoon children’s theatre featuring original, fun-filled Filipino children’s play every month, written and directed by Nestor U. Torre, with music by Maestro Ryan Cayabyab. 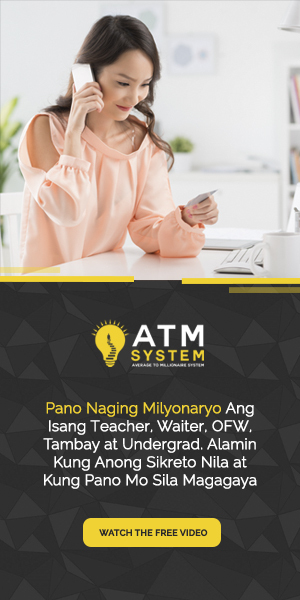 For more details, please call Ms. Marilyn Salvacion at (63 917) 810-8194 or (63 2) 353-8752. 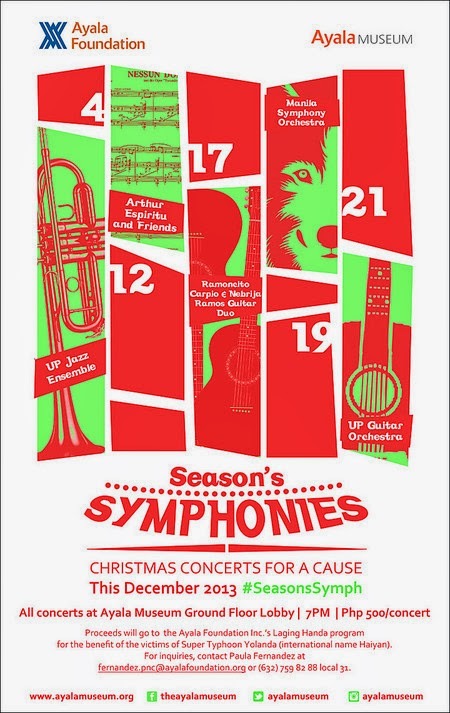 This holiday season, Ayala Foundation, Inc. (AFI) and Ayala Museum present Season's Symphonies: Christmas Concerts for a Cause. On five December evenings, guests can enjoy a variety of musical performances ranging from chamber music, jazz, and orchestra. Through these concerts, audiences will also be supporting Laging Handa, AFI's distaster response and preparedness program which will be receiving proceeds from the ticket sales and channeled to relief efforts in areas recently struck by super typhoon Yolanda (international name Haiyan). With the devastation caused by Typhoon Yolanda (Haiyan) in the Visayas particularly in areas like Leyte, Samar and Capiz, people there still need all the help they can especially food, water and shelter. As a way to help our countrymen, the number 1 music company in the Philippines- MCA Music will host a benefit concert entitled “Music Comes Alive for Visayas: A Benefit Concert for the victims of Typhoon Yolanda in Visayas” on Wednesday, November 27, 4pm onwards at Eastwood Central Plaza. 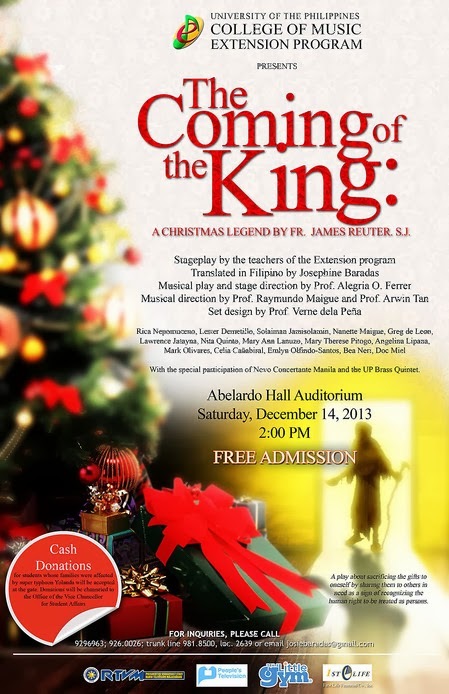 Cultural Arts Events Organizer in partnership with Ayala Museum brings to you a special thanksgiving Christmas concert entitled "A Christmas Offering" on December 3, 2013 at the Ayala Museum at 7:00 in the evening. This ambitious undertaking is the concerted effort of 27 of the country's finest classical artists bonded together to present one of the most beautiful, dramatic and difficult sacred music ever written -"Petite Messe Solemnelle". Get ready for another exhilarating night of music this November as Megaworld Lifestyle Malls and Eastwood City proudly bring the one and only Arnel Pineda in a special live performance. 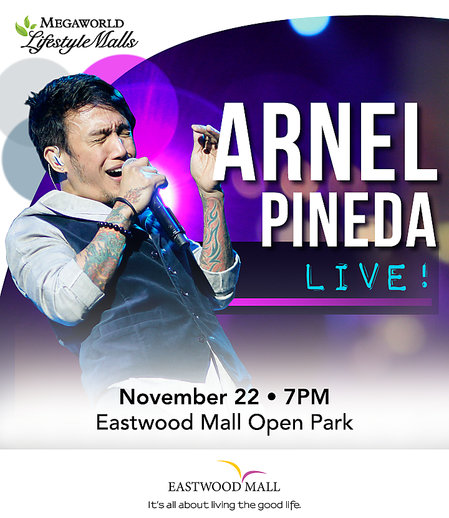 The current front man of American rock band Journey will be performing live at the Eastwood Mall Open Park on November 22, 7PM, where he will be electrifying the crowd with his signature powerful voice while singing a variety of popular rock hits. 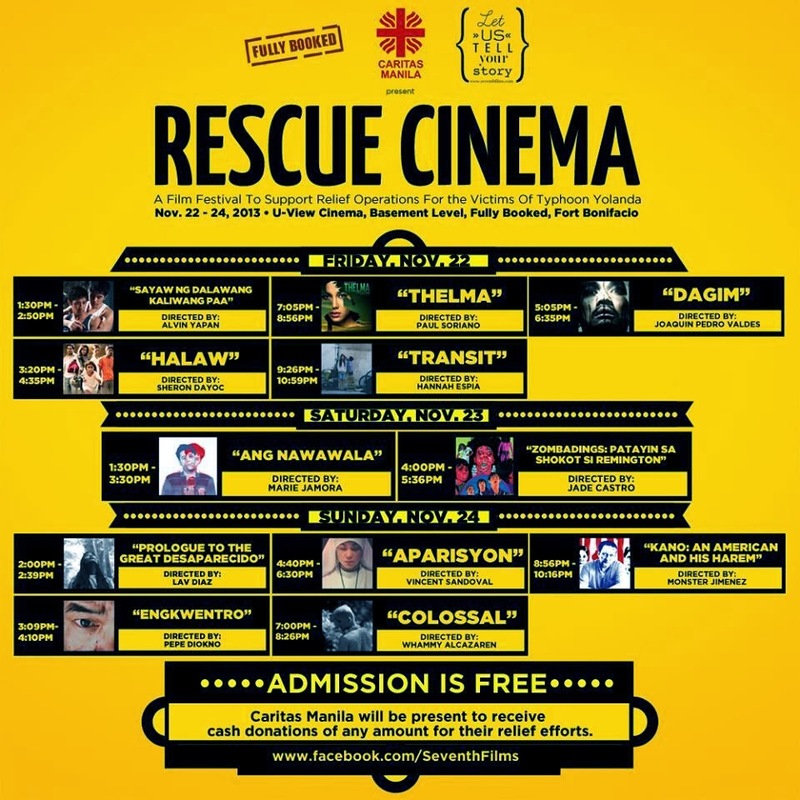 Rescue Cinema, a benefit film festival for the survivors of Typhoon Yolanda, will be opening its doors to the public on 22-24 November at the U-View Cinema, Basement Level of Fully Booked Bonifacio High Street. 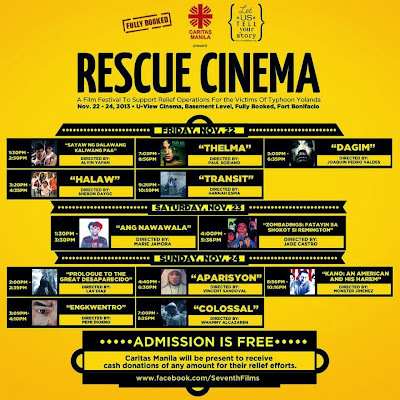 It presents twelve must-see Filipino independent films - all for free. No tickets will be issued for the movie screenings and no reservation is required, but those who will be attending are encouraged to bring cash donations which they can hand over to Caritas Manila for their relief operations. 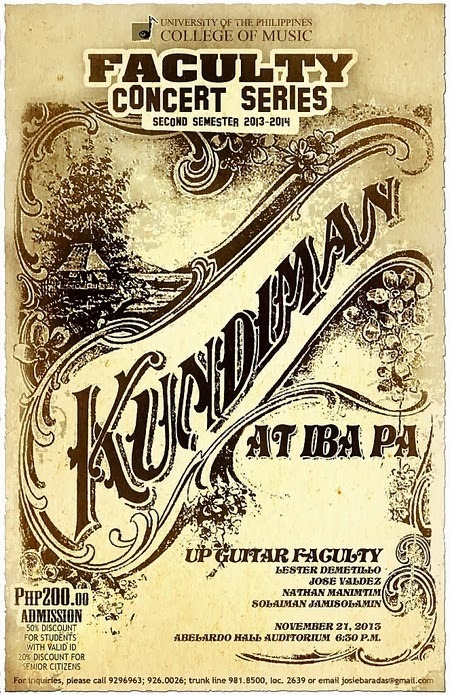 The guitar faculty of the Department of Strings and Chamber Music, University of the Philippines College of Music will present an evening of classical guitar music entitled “Kundiman at Iba Pa" on Thursday, November 21, 6:30 pm at the Abelardo Hall Auditorium. 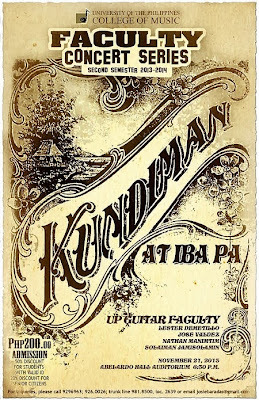 In the concert are the four guitar teachers of the College such as Lester Demetillo, Jose Valdez, Nathan Neil Manimtim, and Solaiman Jamisolamin. They will interpret works by Nicanor Abelardo First Nocturne, Antonio Molina’s Rondo in F Major, Francisco Santiago’s Pakiusap, Julian Balita’s Parang Maghapon Lamang, Ramon Tapales’ Mindanao Orchids, Ernani Cuenco’s Kalesa, Angel Peña’ Iyo Kailan Pa Man, Aga Mayo Butocan’s Binalig and Tidtu A Bagu, Josefino Chino Toledo’s Kal’bit, Ramon Santos’ Abot Tanaw, Augusto Espino’s Improvisasyon, and Jose Valdez’ Philippine Medley. Crizal Transitions, the world’s leading Photochromic lens capable of adjusting to any lighting condition, shines a bright light on the metropolitan cultural scene, as it hosts Crizal Transitions Cinemajam, the first ever outdoor movie marathon and music festival in the Philippines, on November 30, 2013 at Event Circuit Makati. Crizal Transitions Cinemajam brings together some of the country’s top bands, two special movies, and a host of exciting activities. 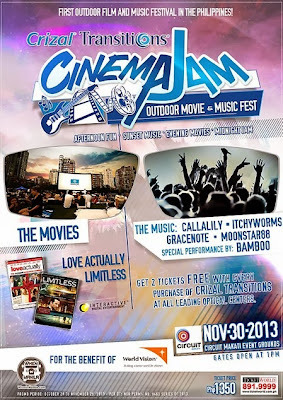 Crizal Transitions Cinemajam sees the arts and celebration in a different and changing light, as it ushers guests through the unique experience of shifting perspectives—a fun afternoon fair segueing into a sunset music festival, capped with an evening movie marathon and after-party concert. 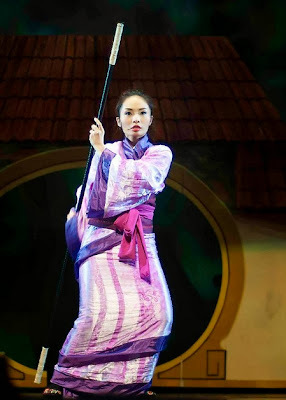 Kids Acts Philippines proudly presents “ MULAN "
The story of Mulan, a popular Chinese heroine, comes from an old Chinese folktale entitled “The Ballad of Mulan”. Originally a poem – Hua Mulan’s story has been adapted into a number of different versions over the years. As a pre-X’mas offering to all schools, parents and children, Kids Acts Philippines proudly presents “ MULAN ” with script and lyrics by LUIGI NACARIO and music by EUGENE BELBIS. Canada's Urban Crawl and the PETA Theater Center present the Philippine premiere of Nanay, a site-specific, performance installation. 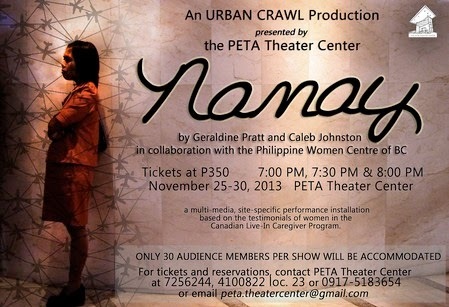 Shows will be in various spaces at the PETA Theater Center, on November 25-30, 2013, at 7:00 PM, 7:30 PM and 8:00 PM. 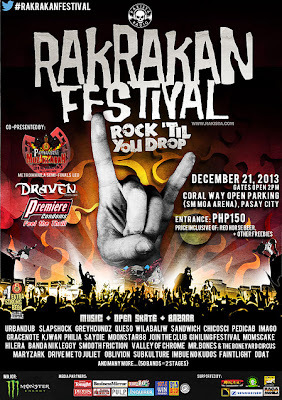 Tickets are at P350 each. There are over a million women OFWs this year alone. That's easily just as many sons, daughters, husbands and families without their 'ilaw ng tahanan' at home. The wealth of experiences from these women OFWs in Canada brought Canadian writers Geraldine Pratt and Caleb Johnston, in cooperation with Philippine Women Centre of British Columbia, to devise the performance installation. The production premiered at Vancouver's 2009 PuSh International Performing Arts Festival, and toured internationally to Berlin, presented at the Hebbel am Ufer Theatre. 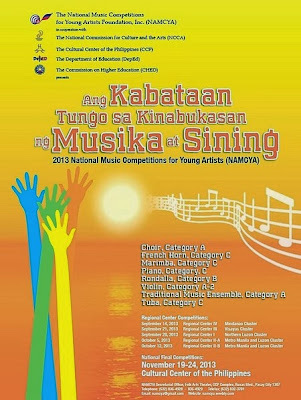 The National Music Competitions for Young Artists (NAMCYA) celebrates 40 years of serving as catalyst in discovering and nurturing young Filipino musicians towards advancement of artistic performance, creativity, and Philippine music traditions. 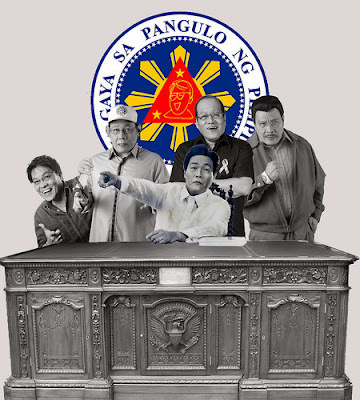 The event runs from November 19-24, 2013 at the Cultural Center of the Philippines. 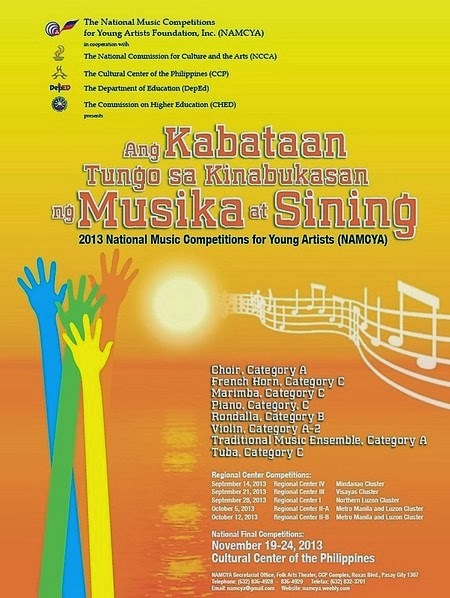 With generous support from the National Commission for Culture and the Arts (NCCA), the Cultural Center of the Philippines and the Department of Education and Culture (DepEd), the 2013 National Music Week will include outreach programs and the Final Round of the various group and solo NAMCYA competitions, culminating in the CONCERT OF WINNERS on Sunday, November 24, 6:00 pm at the CCP Tanghalang Nicanor Abelardo (Main Theater). Bedazzling November continues at Megaworld Lifestyle Malls with another exciting musical showcase featuring the enchanting voices of talented artists from the recently concluded first season of The Voice of the Philippines. 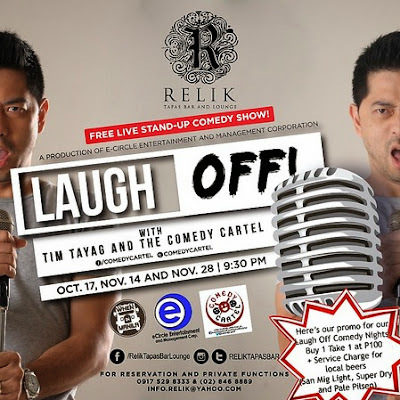 Thor Dulay, the hit reality TV show’s first four-chair turner and pop singer Jessica Reynoso will headline a pair of shows on November 16 at Megaworld Lifestyle Malls. 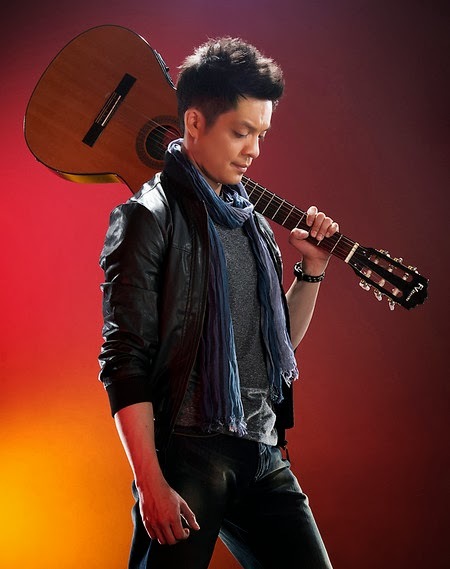 The duo will be performing live at Lucky Chinatown Walk at 4PM and at the Venice Piazza at McKinley Hill, 7PM. Sophisticated jazz infused with the raw power of Filipino indigenous music is coming to the PETA Theater Center. Experience soul-shaking Philippine World Jazz in "Out of Tradition" the Bob Aves Jazz Group concert on December 11, 2013, at 8:00 PM. 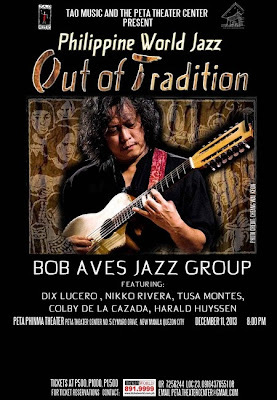 Bob Aves and his group of internationally acclaimed musicians continue to push musical boundaries through a groundbreaking integration of the gong culture of the southern Philippines and contemporary jazz. About 50 of the top and up-and-coming sculptors are joining what has become the country’s biggest and most important sculpture event, Alay Sining 6, which is set to open on Tuesday, November 19, 2013 at the Grand Ballroom on the 3rd floor of the Mandarin Oriental Hotel and continued on Wednesday, November 20, and Thursday, November 21, 2013 at the Clipper Lounge at the 2nd floor of the same hotel. This sixth edition of Alay Sining is sponsored by the Rotary Club of Makati West in partnership with the sculptors and, like the previous five editions, is aimed at helping raise funds for the club’s Gift of Life Program to sponsor the open-heart operations of children from poor families afflicted with Congenital Heart Disease (CHD). Tanghalang Ateneo celebrates its 35th Season: Reimagining the Greeks by staging four classic Greek plays with a contemporary edge. 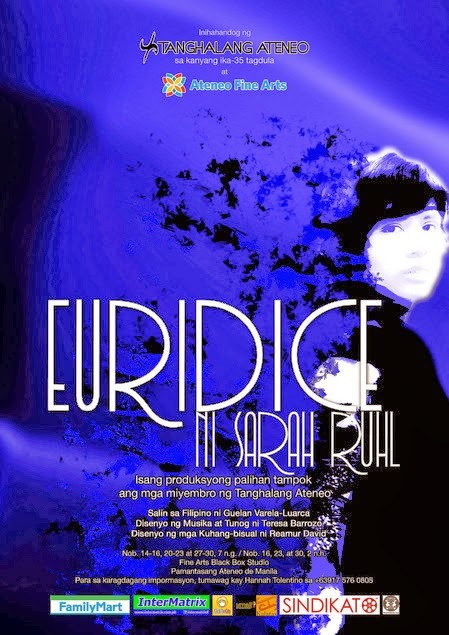 This November, the third of these productions will be a work-in-progress production of Sarah Ruhl’s Eurydice, re-titled Euridice for the Filipino translation. Euridice is grounded on the Greek legend of Orpheus and Eurydice. However, Sarah Ruhl’s modern take on the tale focuses on the female character of Eurydice. 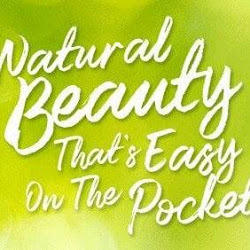 It exhibits romantic love between a man and a woman. At the same time, Sarah Ruhl introduces a new dynamic to the story with the addition of a new character, Eurydice’s father, and it shows the story of a woman’s relationship with her father – the love between a father and his daughter. Tony winner Lea Salonga, who made her professional theater debut at age seven in Repertory Philippines' production of Rodgers and Hammerstein's "The King and I" in 1978, will celebrate her 35th anniversary in show business via a concert titled "Playlist: A Celebration of 35 Years" at the Philippine International Convention Center (PICC) Plenary Hall from Friday, December 6 to Saturday, December 7. 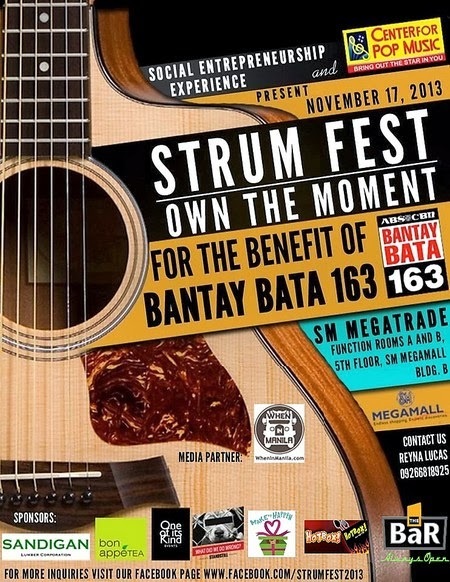 A number of amateur bands from various colleges and universities within Metro Manila would come together at SM Megatrade Function Rooms A and B at SM Megamall, Mandaluyong City for the first ever festival that celebrates acoustic music amongst the youth and for the benefit of the impoverished children of ABS-CBN Foundation’s Bantay Bata 163. It’s a charity-concert extravaganza called “STRUMFEST 2013”. And the driving force why STRUMFEST 2013 is strongly advocating mainly towards the youth is because it’s organized by within the youth as well – the college students of the Social Entrepreneurship module of the Entrepreneurs School of Asia, formerly Thames Business International School. An event by the youth, among the youth, and for the youth – that’s STRUMFEST 2013. 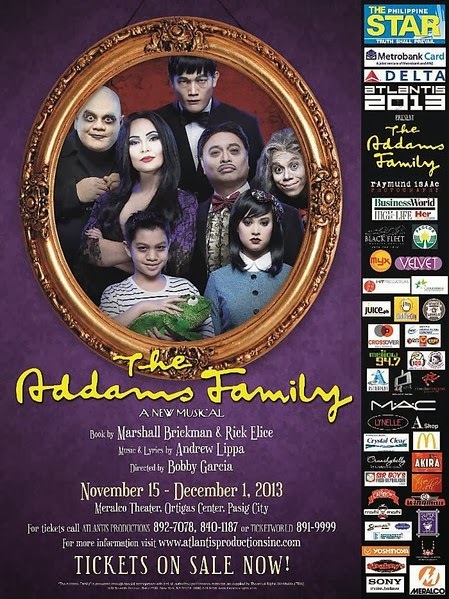 Atlantis Productions ends its 14th season with the hit Broadway family musical comedy 'The Addams Family' featuring an all-star cast. The Addams Family is a smash-hit Broadway musical comedy for the whole family that brings the darkly delirious world of Gomez, Morticia, Uncle Fester, Grandma, Wednesday, Pugsley and, of course, Lurch to spooky and spectacular life. This magnificently macabre new musical comedy is created by Jersey Boys authors Marshall Brickman & Rick Elice, Drama Desk-winning composer/lyricist Andrew Lippa. Catch us at the Fort on October 17, November 14 & 28 at 9:30 PM. Entrance is Free! The Government of the Province of Jakarta organizes the "World Royal Heritage Festival," which will be held on 5-9 December 2013 in Jakarta, Indonesia. The aim of this activity is to lift and preserve the cultural heritage of the entire Indonesian Archipelago and to call for peace and harmony among countries through the promotion of art and culture of each country. 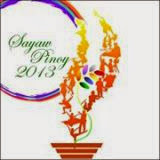 The National Committee on Dance of the National Commission for Culture and the Arts under the leadership of Shirley Halili-Cruz has organized the Sayaw Pinoy: The NCCA National Dance Competition as part of its efforts to promote dance in its various forms – folkdance, neo-classical/contemporary, hip hop and ballroom. It aims to stress the importance of the competition as a means of motivation for artistic excellence but not an end to itself. It also hopes to teach emotional fitness through teamwork as the group experience will bring about dependability, responsibility, commitment, sportsmanship, discipline, creativity and awareness of the value of the art of dance. 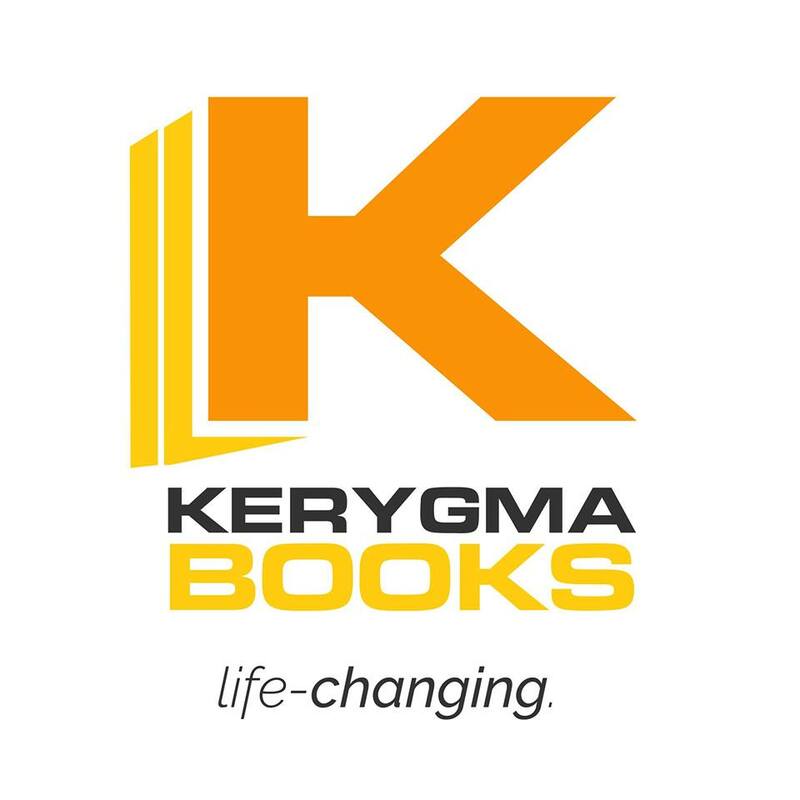 Consequently, acquiring the value of working together as a team towards common goals will extend to daily undertakings beyond the competition. The biggest, the grandest, and the most sought-after choral competition in the Philippines is on its 15th year! 10 of the best high school choirs will battle it out for the chance to win the most coveted Aria. This all happens on November 17, 6 PM at the Cultural Center of the Philippines! 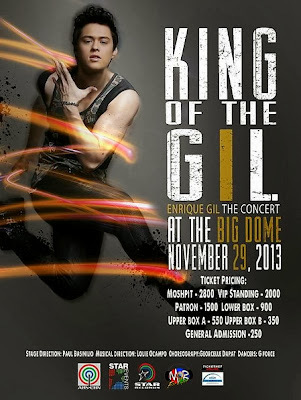 Please be informed that NO TICKETS WILL BE SOLD ON THE VENUE for the Finals Night on November 17. In this regard, we advise everyone to reserve your tickets ahead of time. Don't let this momentous occasion pass! 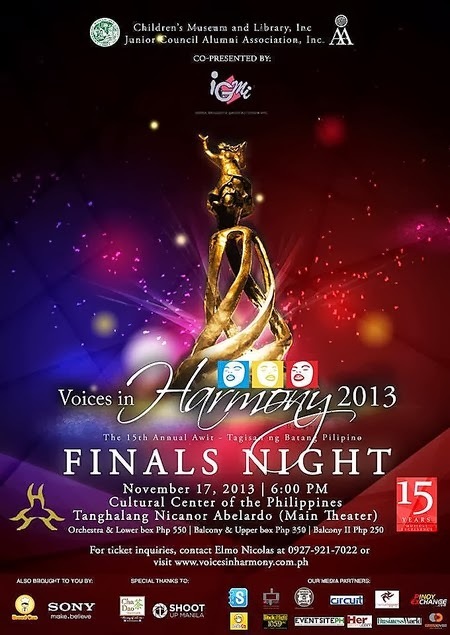 Witness the biggest celebration of musical excellence here in Voices in Harmony 2013: The 15th Annual Awit Tagisan ng Batang Pilipino! 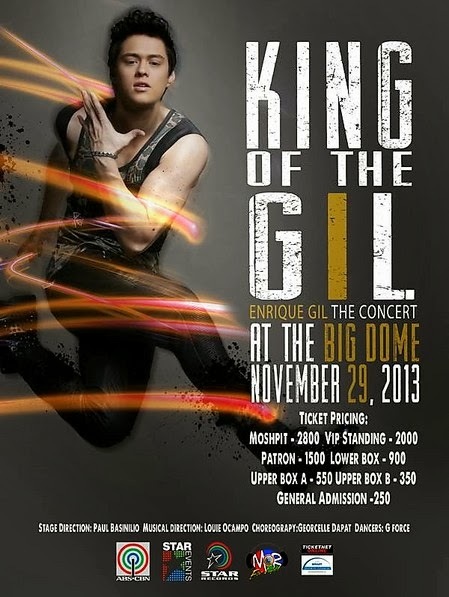 For tickets, contact Elmo Nicolas at (63 927) 921-7022. 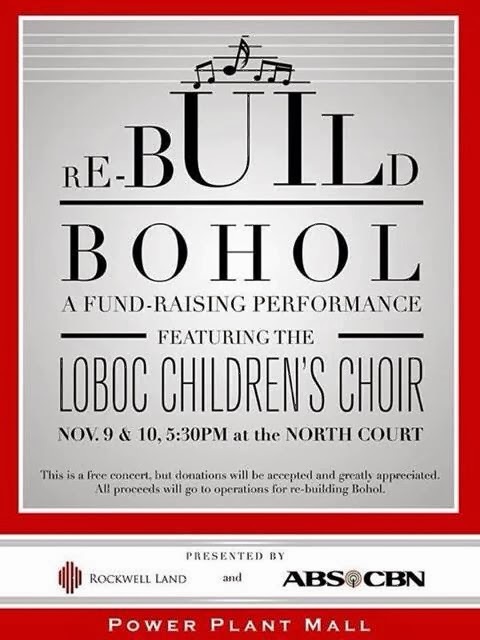 The Loboc Children's Choir has been in existence since 1980, and consists of 30 school children from the Loboc Central Elementary School in Loboc, Bohol, Philippines. The children are between nine and thirteen years of age. 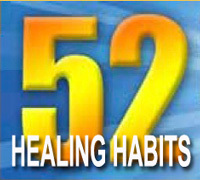 The choir's performance can be seen @ (CBN TV News website) http://goo.gl/fpFOsn. The Phi Lambda Delta Sorority of the UP College of Medicine presents GREASE, a musical revival staged by 9Works Theatrical, on it's Opening night, November 9, 8:30PM. This fundraising event is for the benefit of the Sorority's Scholarship Fund. For more details, please call (63 917) 840-0662. Dayaw, the biggest gathering of indigenous Filipino cultures organized by the National Commission for Culture and the Arts (NCCA), will be gracing Tacloban, Leyte this November 27-30. 2013. The NCCA is led by its Chairman Felipe M. De Leon Jr. and Executive Director Emelita V. Almosara, CESO IV. Spearheaded by the NCCA’s Subcommission on Cultural Communities and Traditional Arts (SCCTA), under Commissioner Joycie Dorado-Alegre, Dayaw is annually done in in celebration of National Indigenous Peoples’ Month observed every October. 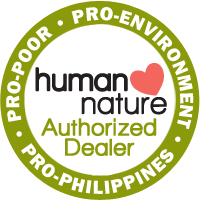 Leyte-Samar Heritage Society, Inc. and the local government of Leyte headed by Gov. Dominic Petilla will be the partners of NCCA for this year’s festival. 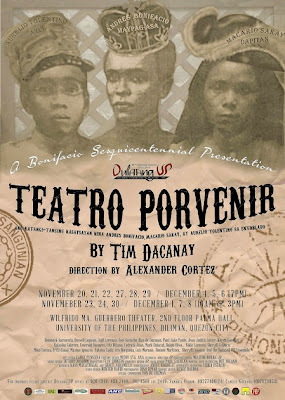 In celebration of Andres Bonifacio’s sesquicentennial, Dulaang UP stages Teatro Porvenir, Ang Katangi-tanging Kasaysayan ni Andres Bonifacio, Macario Sakay at Aurelio Tolentino sa Entablado, a Palanca-winning play written by Tim Dacanay. 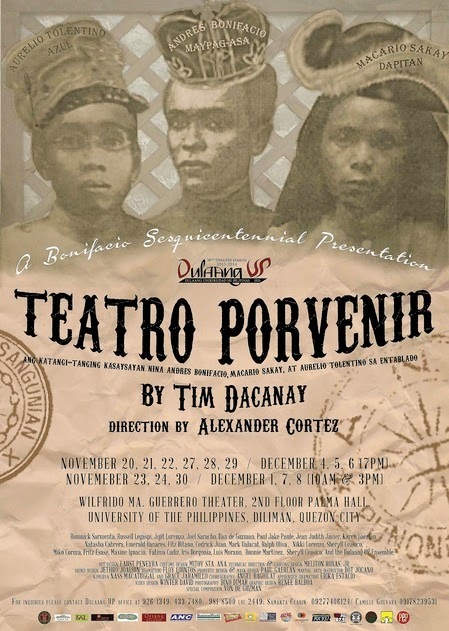 Teatro Porvenir is a re-imagining of the history of the Katipunan through an amalgamation of myth and literature, history and religion. The play highlights Bonifacio as artist- a facet of this valiant revolutionary that remains largely unknown to most people. 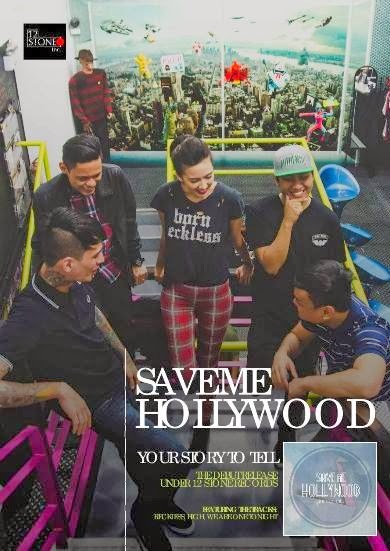 Save Me Hollywood is a Filipino rock/alternative band based in Quezon City, Philippines. 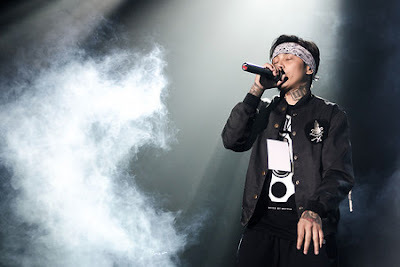 Formed only in 2011, the band is a collaboration between members of influential rock acts Chicosci and Typecast. Bassist Carlos Calderon of Chicosci and drummer Melvin Macatiag of Typecast are joined by April Morning Skies guitarists Aaron Corvera and Kenneth Aranza. Former MYX VJ and model Julz Savard is the lead singer of the group. “I will do everything that will make them stand up, dance and enjoy the night. I will definitely teach you how to dougie and much much more!” promised Enrique about his upcoming show staged by Star Events and ABS-CBN.